Rising geopolitical tensions dominates trading this morning, sending global equities and futures lower as India clashes with Pakistan. Note: Tensions escalated after Pakistan shot down an Indian fighter jet in Kashmir. The yen has strengthened along with U.S. Treasuries as the market waits for part-two of Fed Reserve Chairman Jerome Powell’s testimony to Congress. At yesterday’s testimony, Powell gave no indication that the Fed is prepared to alter monetary policy any time soon. Across the pond, U.K. Prime Minister Theresa May said if a vote on her Brexit deal by March 12 failed, she would offer a vote on a no-deal Brexit and then a vote on extending Article 50 (March 13, 14). However, she indicated that the third vote would only allow a “short, limited” extension of Article 50. She also said this extension still wouldn’t rule out no-deal Brexit. Elsewhere, prices are climbing, reversing some of the losses from earlier in the week that were driven mostly by criticism from U.S. President Donald Trump that prices are too high. In Japan, the closed higher overnight as investors bought into defensive stocks and real estate firms, and took profit from machinery shares that had rallied on progress in Sino-U.S. trade talks. The Nikkei share average gained 0.5%, the broader added 0.2%. Down-under, shares ended higher overnight on strength in financial stocks, though some investors stayed cautious while waiting for the U.S.-Korea summit in Hanoi and for details of what a Sino-U.S. trade agreement might contain. The rose 0.4%. Yesterday, the benchmark fell 0.9%. In South Korea, the (+0.37%) ended higher as the Fed confirmed it’s ‘dovish’ stance. In China, Shanghai stocks ended higher overnight, after the Fed’s Jerome Powell reinforced the U.S. central bank’s recent shift towards a more “patient” approach on policy in the face of a slowing economy. The blue-chip index fell 0.2%, while the rallied 0.4%. While in Hong Kong, the traded down 0.5%. In Europe, regional bourses trade lower across the board following a mixed session in Asia and lower U.S. futures. 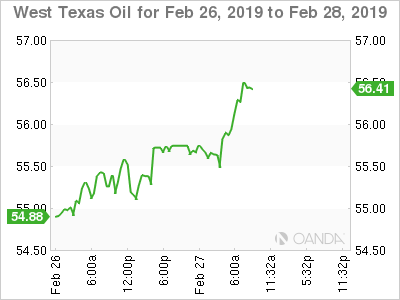 WTI for Feb. 26-28, 2019. Oil prices have rallied overnight after a report of declining U.S. crude inventories and as OPEC+ seems content to stick to its supply cuts despite pressure from Trump. futures are at $65.48 per barrel, up 27c, or 0.4% from Tuesday’s close. U.S. West Texas Intermediate (WTI) crude oil futures are at $55.89 per barrel, up 39c, or 0.7%. Data yesterday from the API showed that U.S. crude oil inventories fell by 4.2 million barrels in the week to Feb. 22, to 444.3 million barrels. Crude oil prices have generally received support this year from supply curbs by OPEC+ who agreed in 2018 to cut output by 1.2 million bpd to prop up prices. Note: OPEC+ has indicated it will continue to withhold supply despite pressure from Trump this week to stop artificially tightening markets. Expect investors to take directional support from this morning’s EIA report at 10:30 a.m. ET. 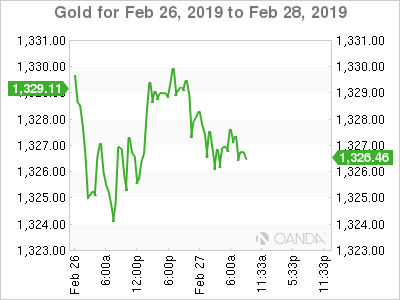 Ahead of the U.S. open, gold is holding steady despite the ‘big’ dollar trading near its three-week lows, after U.S Fed Powell reiterated that the central bank “will be patient in hiking interest rates.” is down 0.1% at $1,327.26 per ounce, while U.S. are flat at $1,329. Gold for Feb. 26-28, 2019. Spanish government bond yields are holding close to their two-year lows this morning after a very strong 15-year bond sale. Even the eurozone periphery bonds are in demand as progress in Sino-U.S. trade talks continue to support a healthy demand for riskier assets. Note: This week sees a number of periphery auctions. Expect dealers to cheapen up their curves to take down supply. This morning, Spain’s 10-year bond yield has fallen to a 28-month low of 1.126% after yesterday’s sovereign sale and holding near to that level this morning has pulled Italian and Portuguese equivalents lower too. Elsewhere, the yield on U.S. 10-year Treasuries has eased 1 bps to 2.63%, the lowest in a month. In Germany, the 10-year Bund yield fell less than 1 bps to 0.11%, while in the U.K., the 10-year Gilt yield has climbed less than 1 bps to 1.21%, the highest in three weeks. 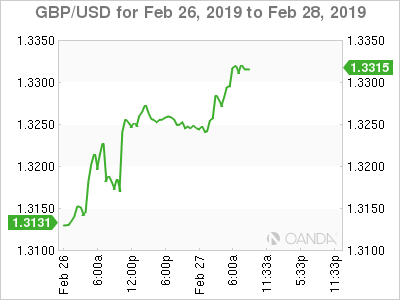 GBP/USD for Feb. 26-28, 2019. Ahead of the U.S. open, the ‘mighty’ USD is on ‘soft’ footing in the aftermath of Powell’s semi-annual testimony in Congress and seems well contained within recent quarterly ranges for G10 currency pairs. The Fed chair reiterated that policy decisions would continue to be “data dependent” and that in no rush to make a judgment about changes in policy. Sterling (££1.3294) trades atop its six-month high as May bought herself more time to secure a Brexit agreement. With a little more than a month to go before the U.K.’s scheduled exit from the EU, lawmakers have yet to settle on a deal with the bloc. 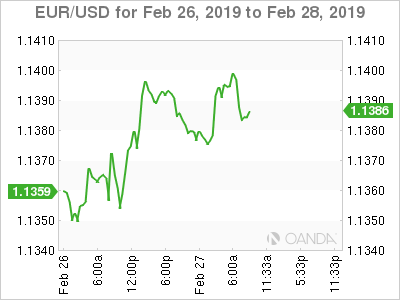 The EUR is unmoved by the weakening consumer sentiment in Europe, given that it had already risen to the key psychological level of €1.14 on the back of a weaker dollar. Analysts are anticipating that the ‘single’ unit will begin to struggle to rise from here. Strong resistance at €1.1425-30. EUR/USD for Feb. 26-28, 2019. Data this morning showed that bank lending to eurozone businesses slowed sharply last month, supporting recent evidence of an economic slowdown in the region. According to the ECB, lending to non-financial corporations grew 3.3%, down from an annual growth rate of 3.9% in the previous month. The ECB’s key indicator of the money supply, M3, grew 3.8% y/y through January, down from December’s 4.1% growth rate. Markets were looking for a 4% growth. A positive in today’s report was that lending to households was stable in January. It rose 3.2% y/y, the same as in December 2018. 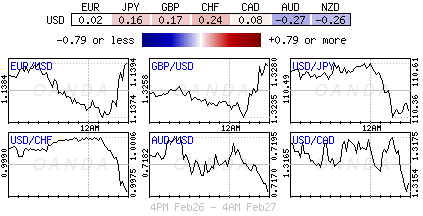 U.S. Dollar Index for Feb. 26-27, 2019.